Japanese doll festival held on March 3rd is called Hina-matsuri. Hina dolls are traditional ornamental dolls used for this festival only. For more details about Japanese doll festival, see this site. The hina dolls are supposed to be taken down and put back in the boxes as soon as the festival is finished, because there is an old saying that if you have the dolls on display for too long, the girl(s) in the family will marry late. Now you know the reason why I'm still single: my family was lazy after the doll festival. I really love these cute wagashi hina dolls. They do look like a man and woman in kimono. Pink has never been my favorite color. When I took photos of my birthday cakes with flowers in previous years, I never used pink flowers. However, I do love the delicate pinkish white of cherry blossoms. I can never fully explain how much I love to see that color in spring -- the season when everything looks fresh and alive. I remember that there were a couple of cherry trees near my parents’ house, including the big one at the gate of our local shrine. I have heard from mom that when she gave birth to me, it was not easy because I was a breech baby. So when I was born safely, someone in my family must have run to the relatives’ house to tell the good news (because we didn't have the phone at that time yet. Ahem!) and visited the shrine to thank God on his/her way home. That “someone” might have looked up the cherry blossoms blooming in the spring sunshine, with the blue sky in the background, and felt rejoiced. When I thought about that, I suddenly felt like making a birthday cake with cherry blossoms. Actually, using cherry blossoms for baking is not such a crazy idea. Recently I see more and more sakura (cherry blossom) cakes and cookies being sold at the stores as well as their recipes shared on the net. You think we make jam out of the blossoms and use it for baking? No. 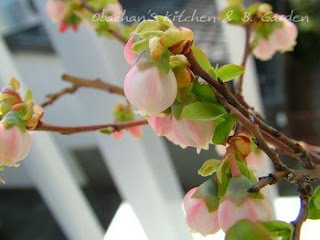 Usually we use salted cherry blossoms or liqueur flavored with the blossoms. For the cake I made this time, I used the sakura liqueur to flavor the top layer and sank some salted sakura in it. The white layer is the mixture of canned white peach and yogurt set with gelatin, and the bottom is a graham cracker crust. The original recipe (Japanese) is here. As you can see in the photo on top of this post, the pink layer of my cake was a bit too soft and the edges didn’t turn out as sharp as I wanted. I was too lazy to buy gelatin sheets (leaf) and used regular gelatin powder, thinking that it would turn out firm enough if I refrigerate the cake longer than recommended in the recipe. Wrong! :P Now I know that there was a good reason for using different kinds of gelatins for those layers: sheet (leaf) for the top layer and powder for the white layer. So I can't say that this was a great success. But there’s something I like so much about this cake – maybe the color combination? – and I'm glad that I chose to make this one for my birthday 2008. Let me add a little more about the aroma of the cherry blossoms. It’s kind of tricky. I don’t think that the blossoms themselves have such a distinctive fragrance like roses or plum blossoms do. When most Japanese smell things like incense, soap, cologne or sweets with “cherry blossom fragrance,” we are not associating it with the smell of the blossoms on the tree; actually we are associating it more with the smell of a Japanese wagashi called Sakuramochi. The smell of sakuramochi comes from the salt-preserved cherry leaf wrapped around the rice cake, and according to some scientific websites, the smell is caused by a substance named “coumarin“ which is contained in the cherry leaves. They say that the substance does not produce the smell while in the live cherry leaves, but does so when the leaves are salt-preserved. Interesting! It was more than a year ago when I read about this creative tofu quiches on Fatfree Vegan Kitchen, and I finally tried it out the other day.